After a good ten years, the shopping centre on Green Street has finally opened! Yippee! With it, comes a whole heap of shops and food places. but out of them all, the one that intruigued me the most was Brioche Burger. This week I graced it with my presence and thought I’d see whether the food was anything worth raving about. We were greeted as soon as we walked through the door and immediately shown to a table. The decor is rustic, with wooden tables, buckets for cutlery and I love that their condiments are already on the table. Big big plus, I really dislike having to ask for condiments. One thing that was missing however was vinegar. The waitress was so lovely and went and found us some from the kitchen.The food is freshly prepared in the back and the customers can see straight into the food prep area which I did like. The menu which is on a cute clipboard is pretty minimal. 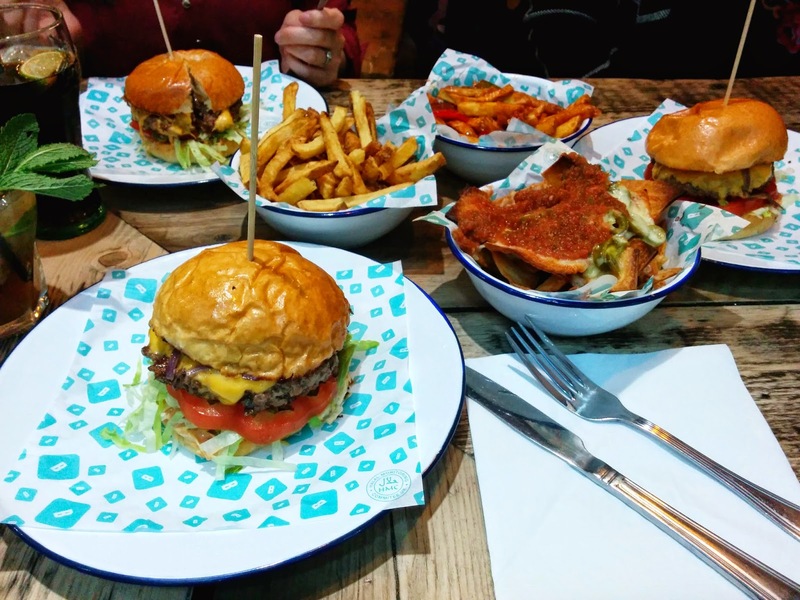 With that said, it has pretty much everything covered, including all kinds of burgers (beef, chicken & vegetarian), all sorts of sides, cold drinks, mocktails and even hot drinks! I’m not a fan of red meat at all anymore, so much so that I’ve cut it out of my diet almost completely, however on recommendation I decided to opt for “the hand of the king”. The restaurant won more points when the waitress asked how we would like our burgers done. I do not eat pink meat at all and I was so relieved to know that it would be cooked to my taste.When it arrived I was pretty glad I did go for it because it was divine. It had the right amount of salad within the burger and the meat to bun ratio (extremely important) was spot on! The chilli chips in particular are my favourite side. They are spicy and extremely more-ish. I could probably eat it every day if it was served to me! The rustic chips are also quite nice but would taste better with vinegar. 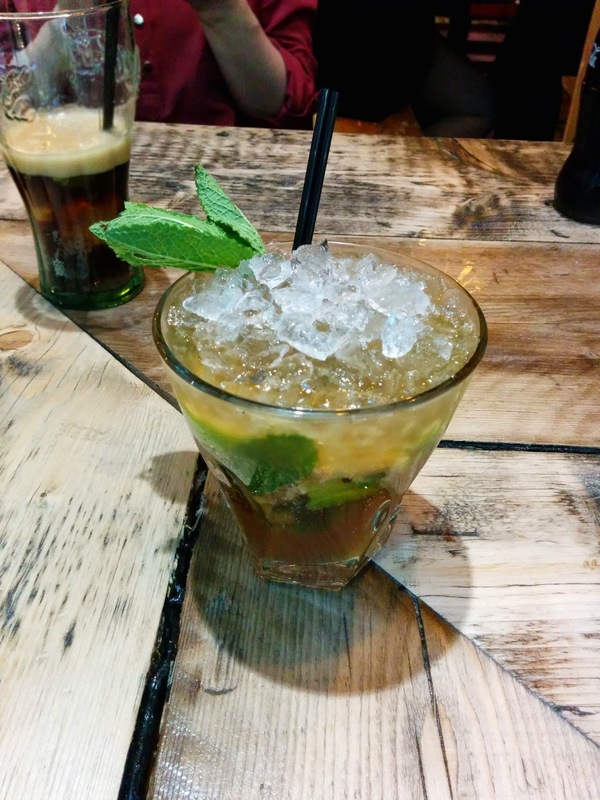 I ordered my standard Mojito and I was glad that even that was made properly (with ginger beer and not lemonade!). I loved the food so much that I’ve visited a few times since. One of the times I went when I wasn’t overly hungry so my friend and I decided to split a burger. The brilliant waitress (so sorry I didn’t ask her name) came over to us and asked if we’d like it cut in half for us. For dessert I had the Pecan pie. I’m not going to lie, it was so delicious that I forgot to take photos of it…well I did remember half way through but there was no way I was going to interrupt my eating of this little slice of heaven. As if they need any more praise, one big positive for me is that the meat is all HMC halal. Condiments and cutlery are all clean. Considering the place has been open for a good few weeks now, it was nice to see that on my returning visits, this has all been maintained. 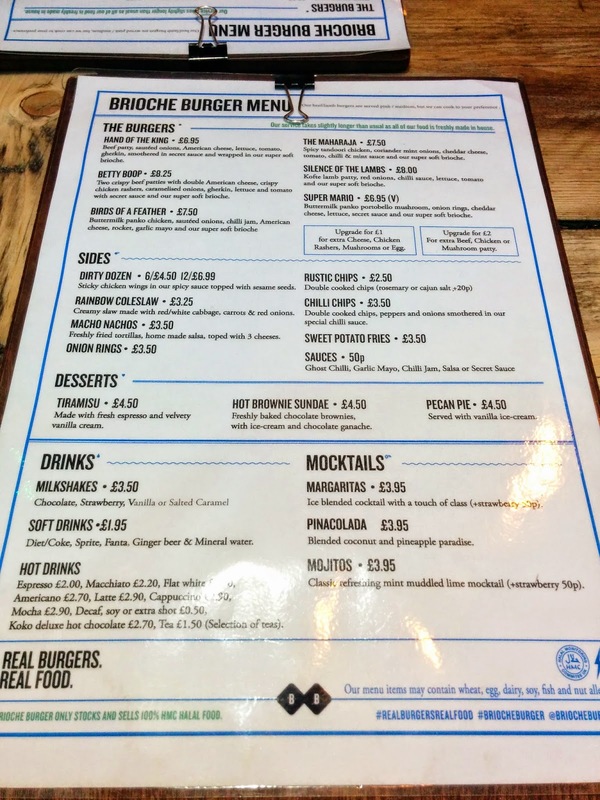 Brioche Burger have perfected American diner style dining. There’s not much more I can say except go and visit this place as soon as possible. The food might be on the pricier side but it’s definitely worth it!